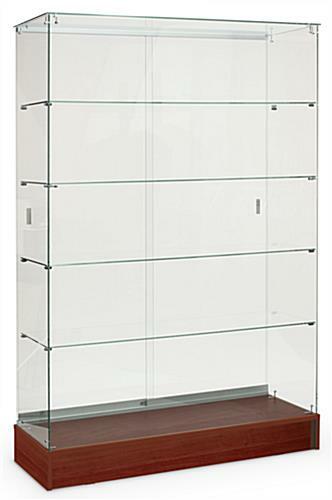 6mm Tempered glass for safety! Locking doors keep merchandise secure! Unassembled for quicker, cheaper shipping! 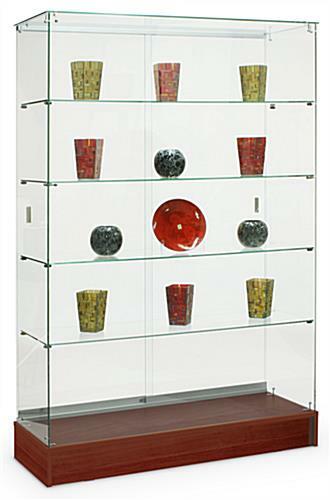 Glass displays are a must-have for many businesses. Retail stores, boutiques, museums, jewelry stores, and gift shops all implement the use of these store fixtures to help product sales. 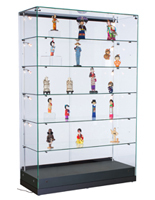 Glass displays, also known as showcases, attract attention to specific items. If you have slow-moving inventory, or simply want to highlight special, "one-of-a-kind" items, these cabinets will do the trick. 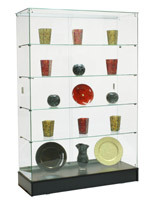 Electronics, handbags, fine china, glassware, jewelry, and souvenirs look spectacular in glass displays. Business or theater lobbies, schools & universities, hospitals and attractions like a Hall of Fame can showcase corporate or sports memorabilia, collector's items, trinkets, treasures and more. 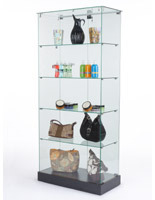 Retail cases, glass displays offer a complete view of displayed merchandise. Customers & patrons can get a full, 360° view, as a result of the frameless design! 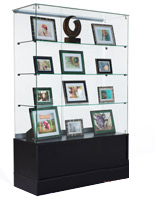 The showcases are crafted from tempered glass, offering a safer alternative to traditional, annealed glass displays. If this material breaks (which is much less likely than with traditional displays), it yields small, manageable pieces, rather than large, dangerous shards. These store fixtures feature sliding doors with a key lock. Four fixed-height shelves are included, for a total of five levels of display space. 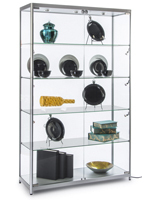 Each shelf can be removed as necessary to accommodate taller items. 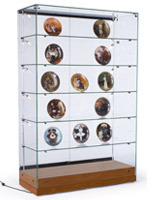 These display cases are sent knocked-down to lower shipping costs. Assembly is straightforward, but requires at least two persons. Please Note: We are offering this case with Dock to Dock shipping only. 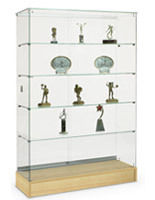 Very nice display case, great value and receive it on time....Thanks!! !